When I finished the Secret Garden Hummingbirds a little earlier this spring, there was yet One More Project hanging over my head, nagging me. 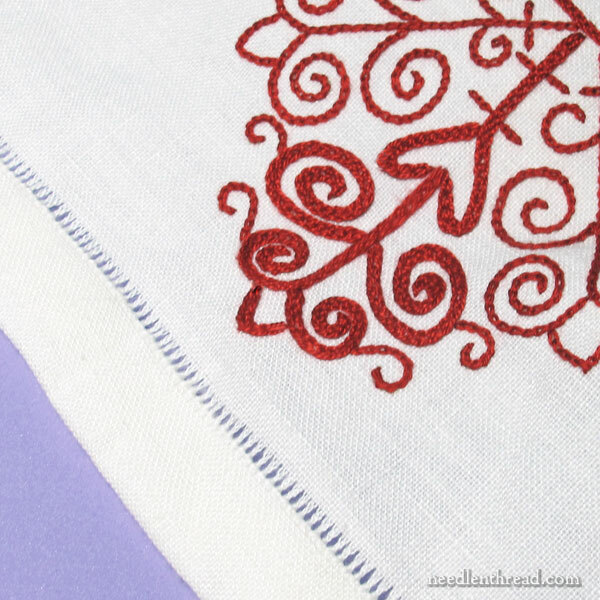 Relatively speaking, this Hungarian Redwork Runner embroidery project has been the longest lasting project that’s ever dragged on and on and on here on Needle ‘n Thread! Part of the reason for this is because the project was always meant to be a grab-and-go project – the type of embroidery project that I could take with me traveling, or that I could just grab and work on, whenever I wanted something easy and convenient to stitch. I never had a real deadline set for the project, even though I set several (unmet) deadlines along the way, in brief moments of naive optimism. In short, I never saw it as a project that I had to complete by a certain time – just as a project that would always be there. Well, it’s not going to be there much longer, I’m very happy to say! As you can see, the hem on the runner is relatively narrow – it’s one inch wide, on the outside of a drawn thread line. This allowed for a double turn-under. I turned the excess fabric outside the drawn thread line a half inch in, and then folded the remainder of the excess fabric in half (so, about 2″ folded in half, to equal a 1″ wide hem) to meet up with the drawn thread line that I showed you the last time we visited this project. I tucked the tails of the drawn thread threads (they’re about an inch or so long) into the mitered corners on the back of the runner. If you’d like to see how this kind of hem set-up is done, and how to miter corners, visit this article. It covers the essentials. The only difference with the runner is that the hem has to be folded so that its edge meets the outside edge of the drawn thread line. Once all the folding and pressing was done, I pinned the hem all the way around and then basted it carefully. Then, I mitered the corners. 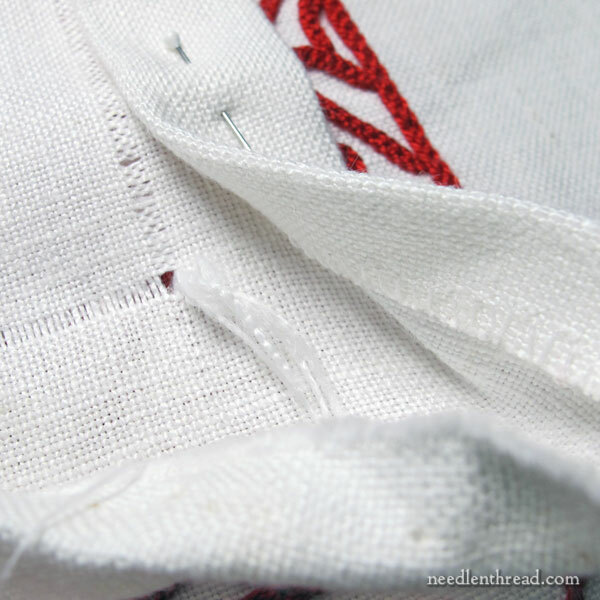 At first, I withdrew only two threads from the fabric, but once the hem was basted and the corners were mitered, I decided to withdraw three more threads towards the inside of the runner, to make the drawn thread strip a little more pronounced. I’m working the basic hemstitch around the runner, catching the edge of the hem on the back. Once the hem side of the drawn thread area is hemstitched, I’ll work the hemstitch on the inside side of the drawn thread strip, too, to completely separate the threads remaining in the drawn thread area. This will give the hemstitched line a nice, crisp, open look. You can find a tutorial for hemstitch here. When working it on a hem, the concept is exactly the same, except that you pick up just a tad bit of the folded hem with each stitch. Guess what this means? Another finish is looming! And that’s pretty exciting. I can’t wait to see it laid out flat and crisp in the center of a table! Good morning, Mary. I can hardly wait to see the finished Hungarian Redwork! Redwork is very appealing to me, and I love hemstitching. I’m on the first round of hemstitching for an altar cloth – slow going for me. Good luck with your finish! Thank you for sharing. Happy stitching! So exciting! I do love a nice finished edge. Looking forward to seeing the whole thing aaaallllllll finished. It is a very pretty runner. I always thought of it as a holiday table décor, thinking you somehow missed your deadlines each Thanksgiving and Christmas! Anyway, you must be glad to be finishing it up! It has been a long time since we have seen an update on the Red Runner and Hurrah it’s nearly finished and I love the drawn thread hem it’s lovely and yes I can’t wait to see it laid flat crisp in the centre of your table. You will have to have a dinner party to show it off in all it’s glory, I wish I could come to see it in the flesh. Well done and thanks for showing us an update on the Red Runner and for sharing your hem techniques with us very useful, I can’t wait to see the photos of the finished piece on your table. Wonderful accomplishment and what a pretty cloth. Are you going to keep it? So often, needle workers give away their works of art. Hmmmm! It looks so perfect, that it’s hard to believe that you made this with your own hands and not by machine. You are to be admired and I’m so envious. Thank you for sharing. Thanks, Joan! I’ll probably keep it. I don’t know yet. It would make a good gift! I’m about 3/4 done on the embroidery on this. Been awhile since I worked on it. I may have to reteach (is that a word) myself the braid stitch. I love this runner and I’m very much looking forward to seeing it finished. Can’t wait! I’m pleased you have decided on the white border rather than the red – red could have detracted from the lovely embroidery. All in good time – it’s not a race!